i don't like the texture on the left side and everything there seems to be out of place, and the left and right side are too different. the quality is kinda poor, but perhaps your most unique wallpaper yet, impressive actually, I would say the feeling it gives me is disorientation, whilst maintaining a certain degree of style. Perhaps it needs improvements on the quality of the BG, other than that, it will need a better adjustment of the poor quality Alucard scan, you might wanna use color adjustments and smart blur next time. Maybe if the window frame faded more into the black? Or the right side had distinct raised areas to feel more 3-d like the left side? OMFG! That's awesome ooo I so Love Arucard (yeah, he is hot) and gosh this wall is so cool a fav from me. ^_^ nice job. it looks cleaner now, much better. keep up the good work. Man awesome wall i sure like it. Good job you won a fav from me. And hell yeah Hellsing is one the best anime ever. unique and awesome, realy admire it , what else? somehow the designs are nice here...like something ancient from the past..
Wow! Great job! I love the atmosphere! Nice wallpaper. Definately one of my favourites. Thanks for share. But really nice. The effects done here are new and great. Those three days really paid off Uchiha-vegeta. I can't imagine how difficult it was for you. But you pulled it off well. Great job overall. I give ya a solid 10 neh? Scary and dark wallpaper. The first time when I saw this wallpaper, make me afraid. But really nice work with the whole part and I really like it. The window is cool too. Good work on this, my friend ! And lastly, Happy Valentine`s Day to you ! Wow, awesome wallpaper. 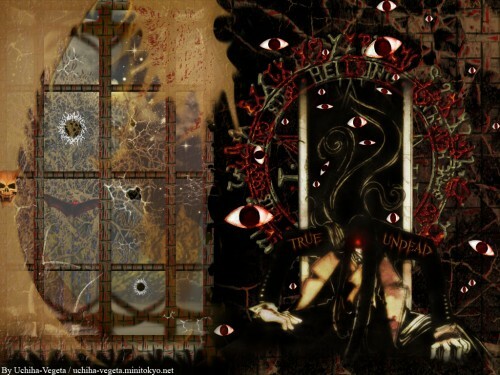 I love the window and I like the image of Alucard. The eyes freak me out though...but they freaked me out in the anime, so it's not your wallpaper. Sorry that it took me so long to comment, haven't been on here for a few days. Anyway, this is a fave for sure.